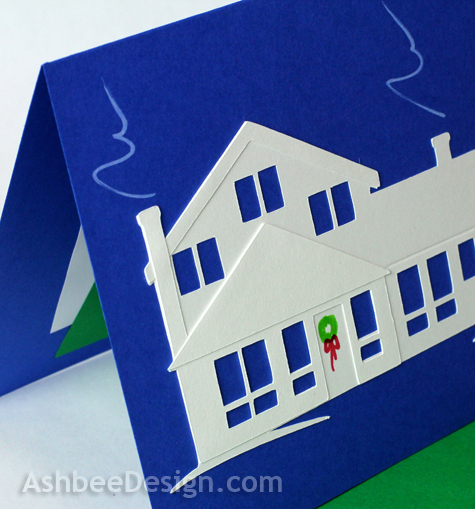 Every year for the past three decades I have handcrafted our Christmas Cards. I have posted all of them (although only last year's with DIY steps) and links are at the bottom. Each year, I share my current card after my family and friends have received theirs in the mail so I don't ruin the surprise with a blog post. 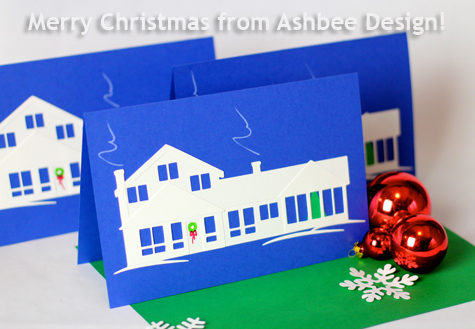 The cards have been received so now I will share with you my 2012 Christmas Card design. You can tell I got a Silhouette Cameo this year! 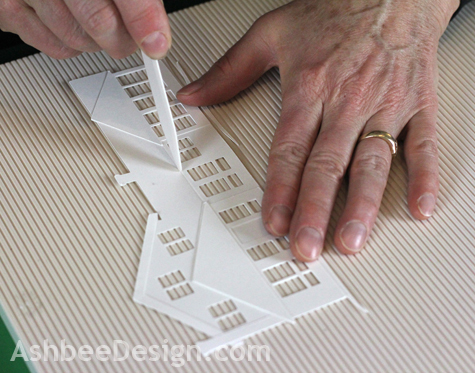 This design features our home created by layering paper cutouts to emphasize the architectural features. 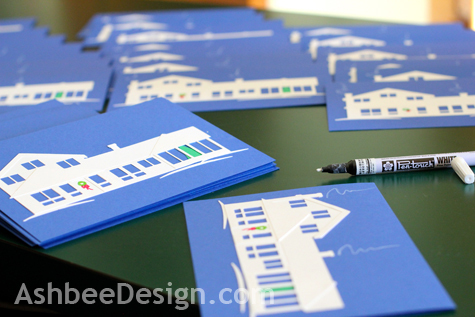 It is consistent with the strong colors and graphic design that you'll see throughout my other designs as well. Below in the detail shot you can see how I defined the house by selectively building up three layers of white paper shapes. 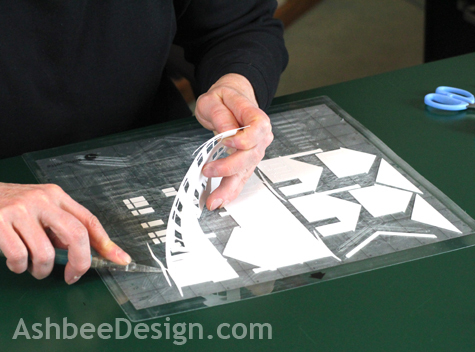 I sketched the design in Pages, split the architectural elements to define the house, transferred it to the Silhouette software and had the machine cut out the parts. This post is not intended to be a tutorial but, sometime in the new year, I will create a tutorial for others on how to do the same from a photograph of your home. 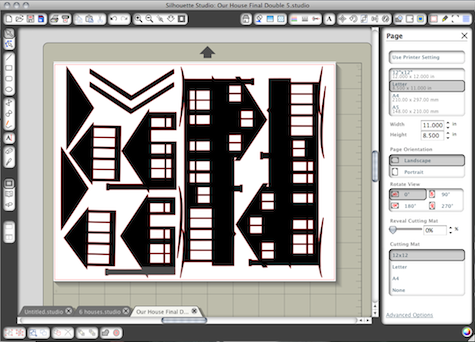 This is what the Silhouette file for two houses looked like. And here are a few production line shots...... I made 70! 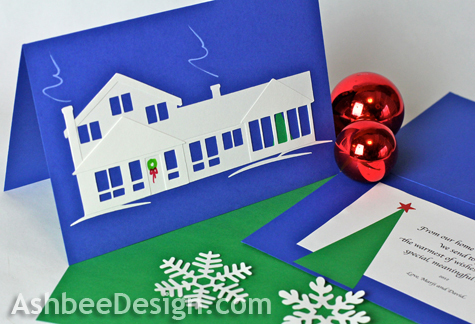 I will create a tutorial on this card in November of 2013 if you are interested in making one next year! And with this card, I send to you all wishes for a very Merry Christmas, and a happy, healthy New Year. And if you don't celebrate Christmas, I send to you the very warmest wishes for peace and happiness. As promised, here are links to my other card posts as well. Thanks Merry, and if I were to guess, I would guess that your name reflects your birthday. Merry Christmas and Happy Birthday, too! It's beautiful! Love all the beautiful details including the wreath and the smoke from the chimneys. Merry Christmas to you and yours, Marji! Our wood stoves are chugging away and we have real smoke coming from the chimneys. My real wreath is the PVc one I blogged about a couple days back! Merry Christmas Bettsi!